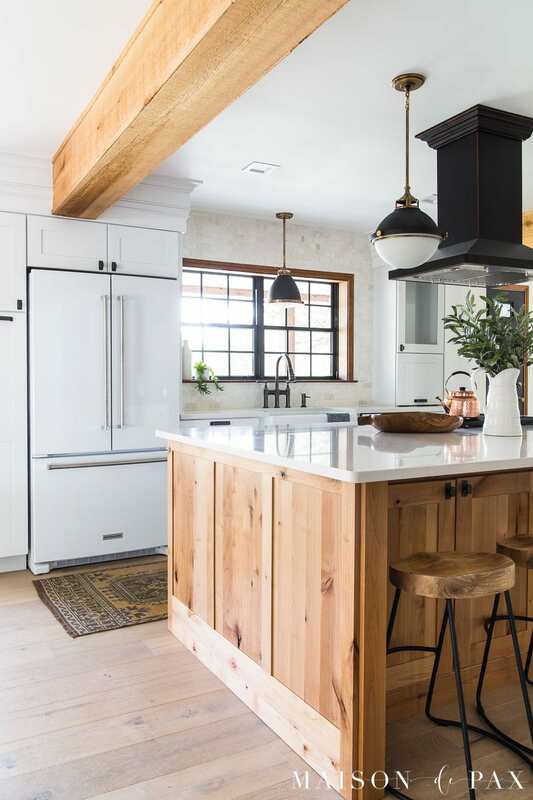 This rustic modern kitchen was designed with a large kitchen island and plenty of creative storage options to make the perfect modern farmhouse open concept kitchen / living / dining space. I cannot even explain the happy dance I’m doing right now. Just imagine something so epic that my children would be embarrassed to be seen with me for at least a week. Why the over-the-top awkward jive? Well, this project which has been months in the making (and, honestly, almost a decade in the dreaming)… and it turned out even better than I could have imagined. As we get closer and closer to being able to really use this new weekend place for our family (we’re still finishing out a few things upstairs before we can put it to full use), the excitement is only growing. I’ve got so many details to share with you about the full space, but today I want to focus on one main thing: the kitchen cabinets. This post is sponsored by KraftMaid. All opinions are my own. I first shared a few months ago my overall vision for this space. 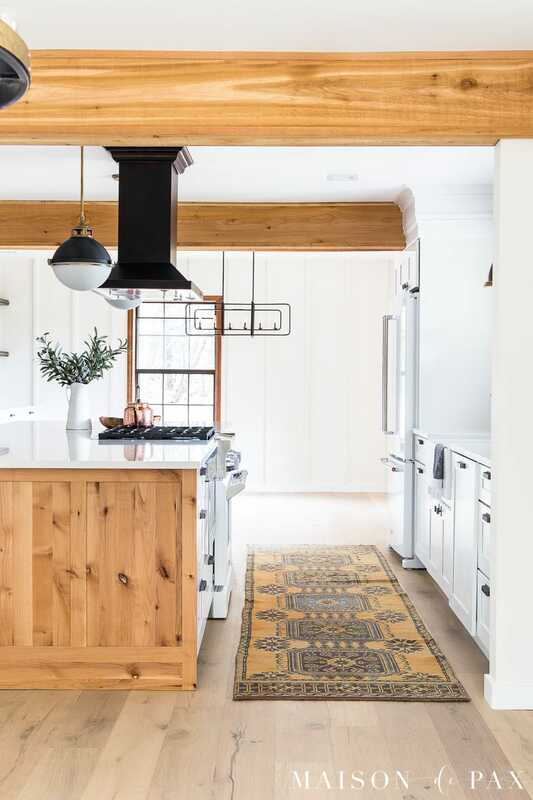 The main thrust of the plan was to remove the walls on either side of the kitchen and turn the front of the home (what was formerly a small living room, narrow kitchen, and a bedroom) into a large, open living/kitchen/dining space. As a reminder, this is what the interior looked like before. 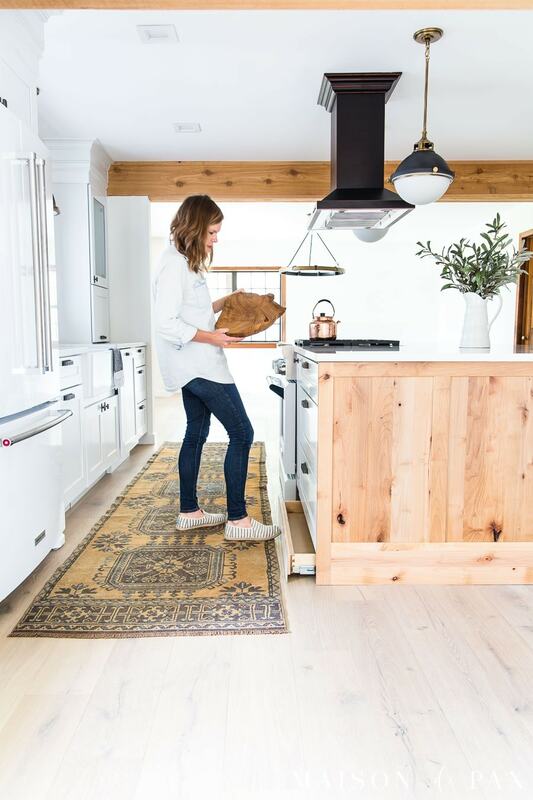 Key to creating that new space (and any kitchen, really) was the cabinetry. In this case, we needed a huge island to provide working areas, seating at the bar, and easy flow between the three spaces. So I partnered with KraftMaid to design the perfect rustic modern space. If you knew the number of samples I carried around with me and the number of different combinations I considered, you’d be tempted to roll your eyes as much as Mr. Pax did in this process – ha! But truly, there were so many good options, it was very difficult to choose. 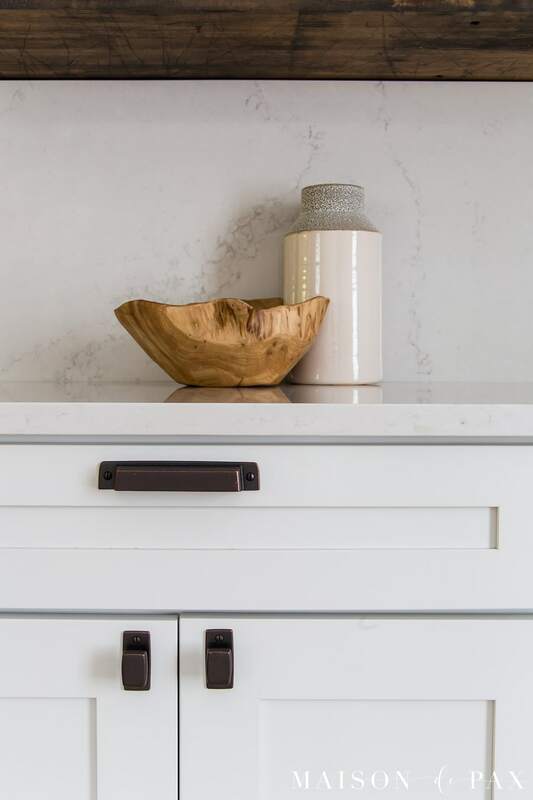 In the end, we landed on a rustic alder cabinet in natural for the island (you can read more about our decision process here). 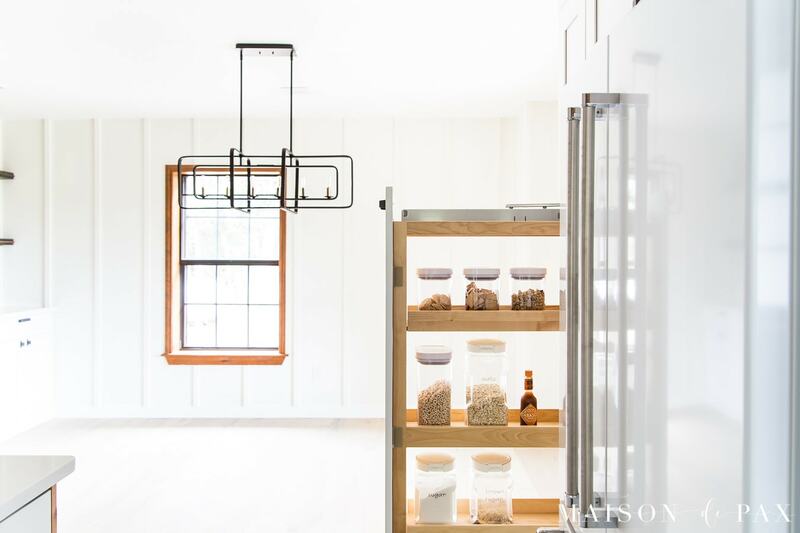 The style is a simple 3″ shaker cabinet, and in the rustic alder it gives a warm, country feel that’s perfect for this little ranch house. 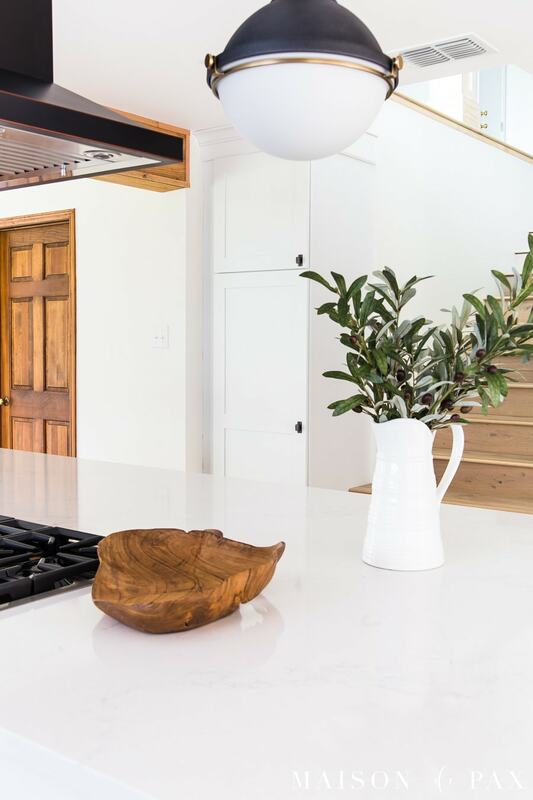 To balance out the country feel of the wood island, though, I wanted some crisp, clean white cabinetry, as well. 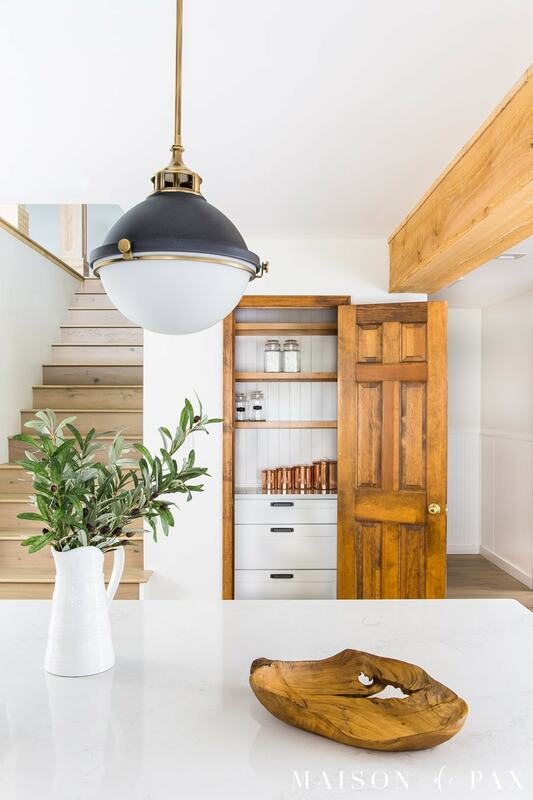 So we used Dove White 3″ shaker cabinets in maple to create the main working space with a sort of galley-style kitchen between the island and the front of the house (see more about kitchen layouts and design options here). In this area, we’ve included all our major working kitchen aspects: the triangle (fridge, sink, stove), trash, pots and pans, and more. We topped all the cabinets off with these beautiful bronze knobs and pulls, also provided by KraftMaid. Although the full space is amazing (truly, I’m blown away every time I step through the door! ), the actual working kitchen is not huge, especially given our plans to fill this home with lots of family and friends. As I mentioned, it is essentially a 10′ galley-style kitchen, so creative storage within this section was a big priority. Luckily, KraftMaid cabinets made it easy! I have a spice pull out right beside our stove in my other kitchen that I love, so repeating that here was definitely in the plans. 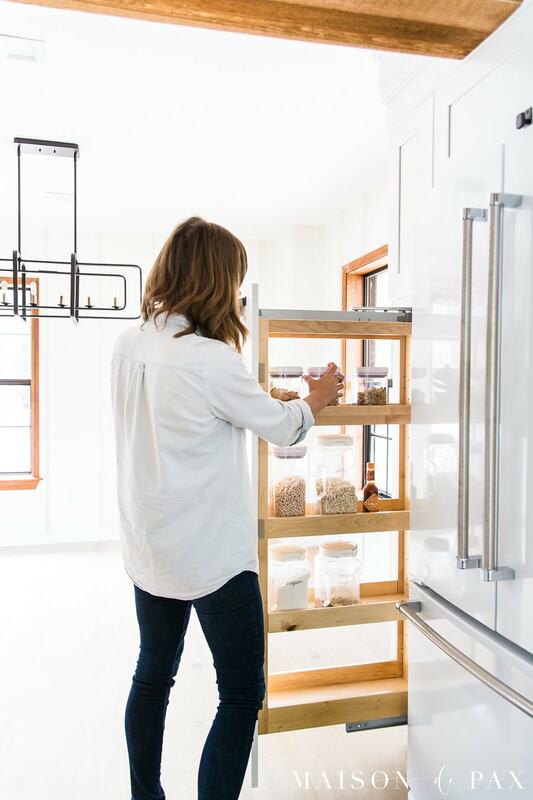 And since the main pantry is all the way around the island, I wanted some kind of smaller pantry-style organizer within the working space… And a larger pull-out beside the fridge was the perfect solution. I know this is not a novel concept, but our other kitchen does not include a trash pull out, and we have always missed it… This double trash pull out (which even includes a special liner between the trash drawer and the top drawer to block odors!) is such a convenient addition to a functioning kitchen. It’s the small things, but this might be my favorite aspect of the brilliant KraftMaid options. 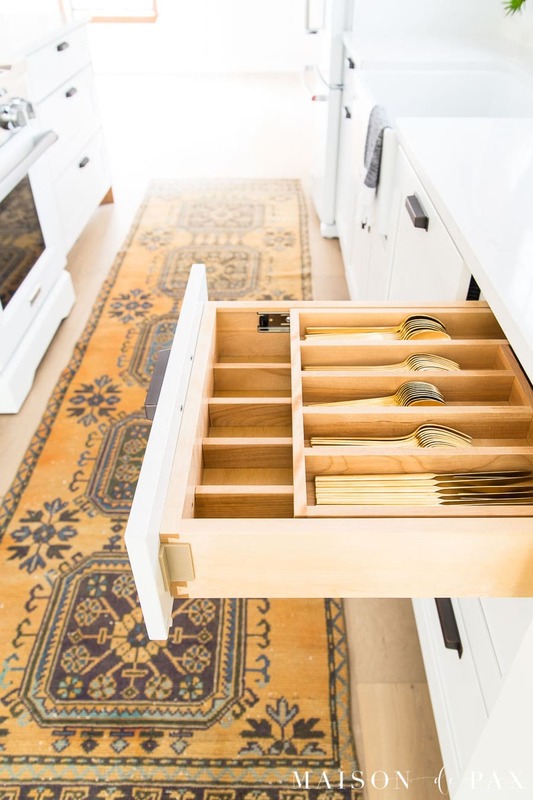 These layered cutlery organizers are so beautifully made and offer endless options for organized storage. Portions slide open to reveal more storage underneath! I haven’t even decided what will go into these canisters yet, but I love them! Pegs and dividers offer beautifully organized pots and pans within reach. This was a new option for me! 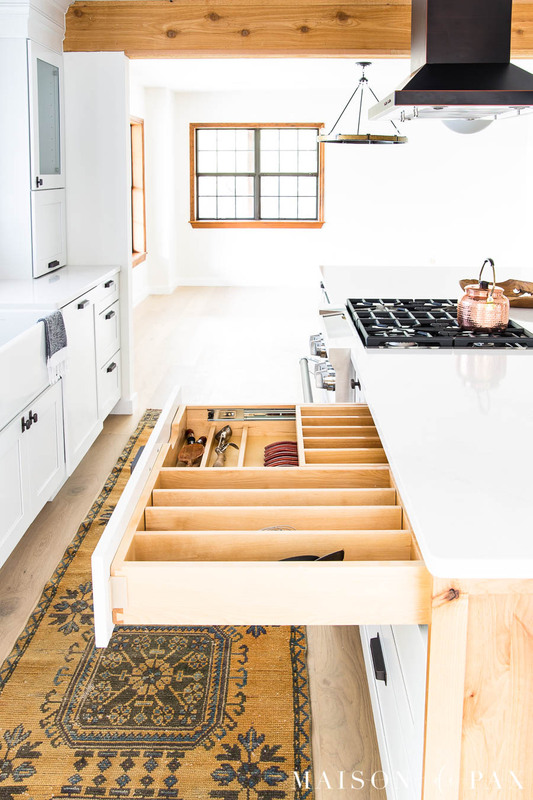 Did you know they make drawers that actually use that formerly wasted space beneath the cabinets? 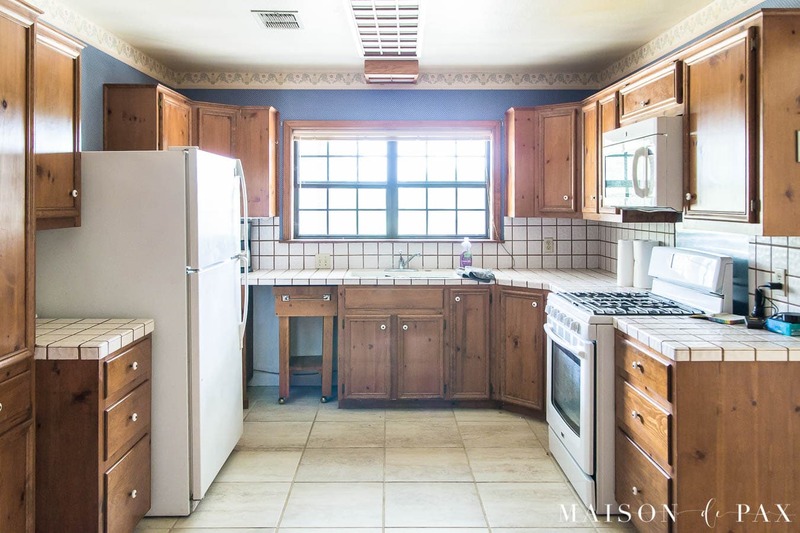 In this big-island kitchen where we will likely be entertaining kids at the bar, it’s a perfect option for coloring books or other things my kids would like to use but would be in the way in the actual kitchen cabinets. I think we may end up with placemats or cookie sheets in them, too! 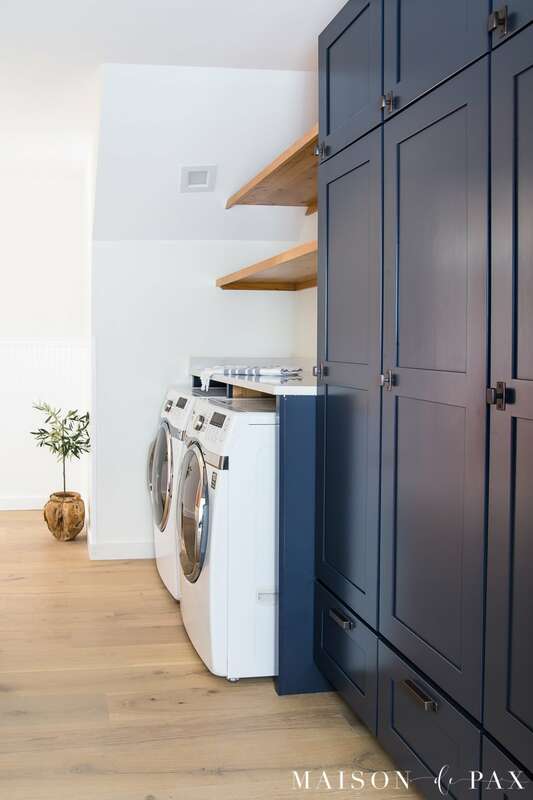 As if all those amazing small-space organization options weren’t enough, we used more beautiful KraftMaid cabinetry throughout the space to really optimize our storage. We used an additional bank of cabinets to act as a credenza in the dining room; we can store dishes and serving items below, and the counter provides the perfect buffet for large family dinners. We also included cabinetry under the bar for additional storage. 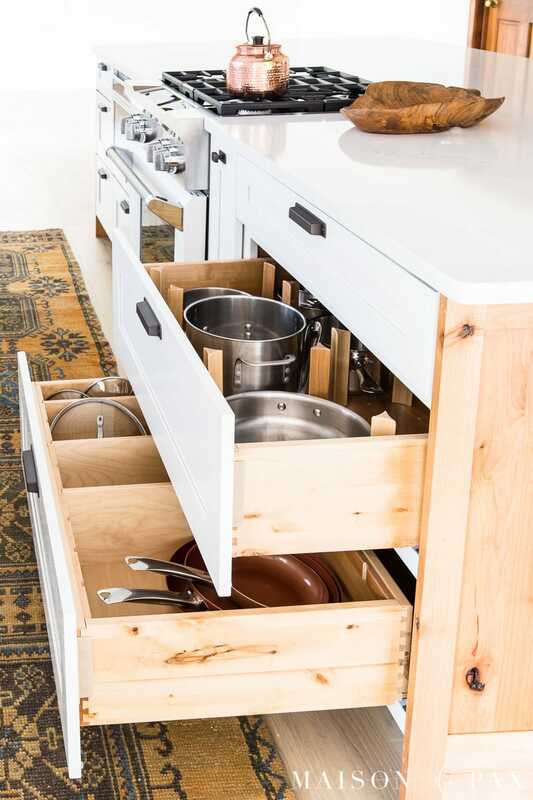 It’s not super easy to access, obviously, but roll out drawers help, and it’s perfect for a little extra space. 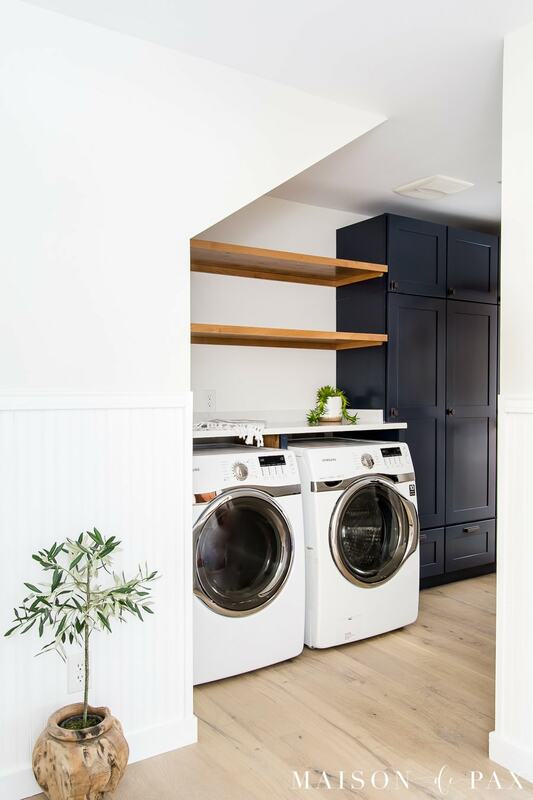 We filled up a little empty nook beside the stairs with a floor to ceiling cabinet with broom hooks below and shelves above – perfect for cleaning supplies. And finally, we converted the former AC closet into a little walk in pantry. Drawers and shelves line the walls for additional storage in this sweet little space. And more to come on this soon, but here’s a sneak peek around the backside of the pantry into the laundry area. We continued the 3″ shaker cabinets but changed it up a bit with the color. The mudroom-style cabinetry in there is even more storage for this full house. In addition to all the innovations and creative storage options, I am consistently blown away by the quality of the KraftMaid cabinetry. If you know the story of our other kitchen, you know that we purchased the home with KraftMaid cabinetry already in it, and we loved the quality as well as the option to update the look (which wasn’t our style) simply by replacing the doors. So, completely unsponsored and out of our own pockets, we purchased KraftMaid doors for that space… and love them still today. That made my decision easy when it came to working with KraftMaid on this project, as I could already rave about the quality of the craftsmanship. The soft-close drawers and doors (which come standard) are wonderful, too. 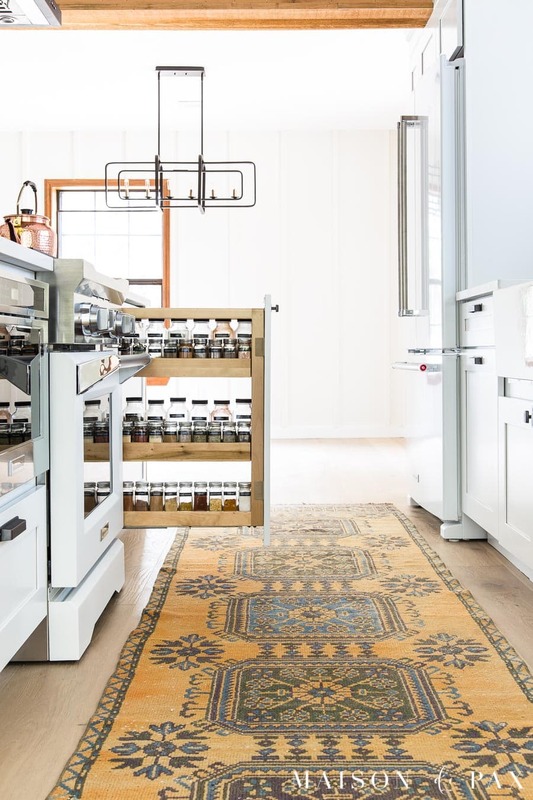 Thank you to KraftMaid for your partnership and beautiful cabinetry… and most of all for your incredible encouragement of me and my designs for this space! 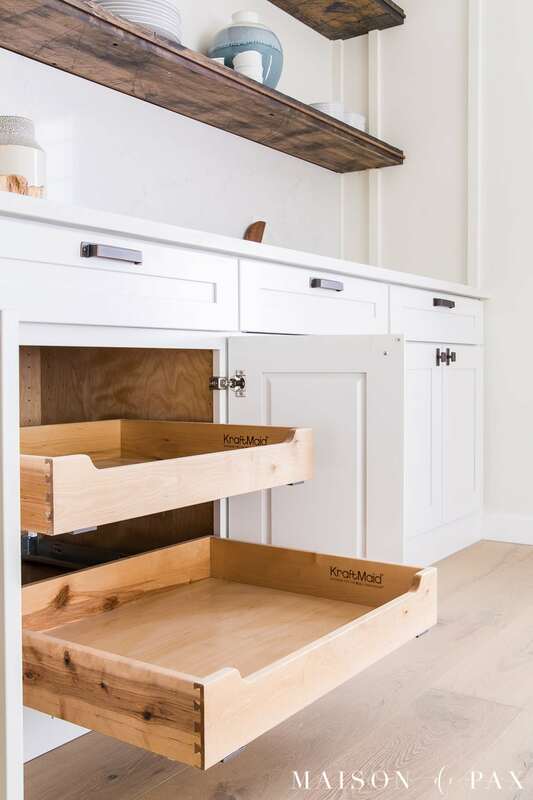 To the rest of you, visit KraftMaid for more kitchen and cabinet design ideas, or visit your local retailer to work with a KraftMaid certified designer on your own space. It’s beautiful Rachel! You should be so incredibly proud…and I’m super jealous! I can’t wait to see the rest of your sweet house! I still have to get furniture, but either way, the kitchen is the perfect place to be! Rachel!!! It’s SO GOOD! I would move a mattress and sleep in there just to spend more time in that kitchen. And all the cabinet features are killer! 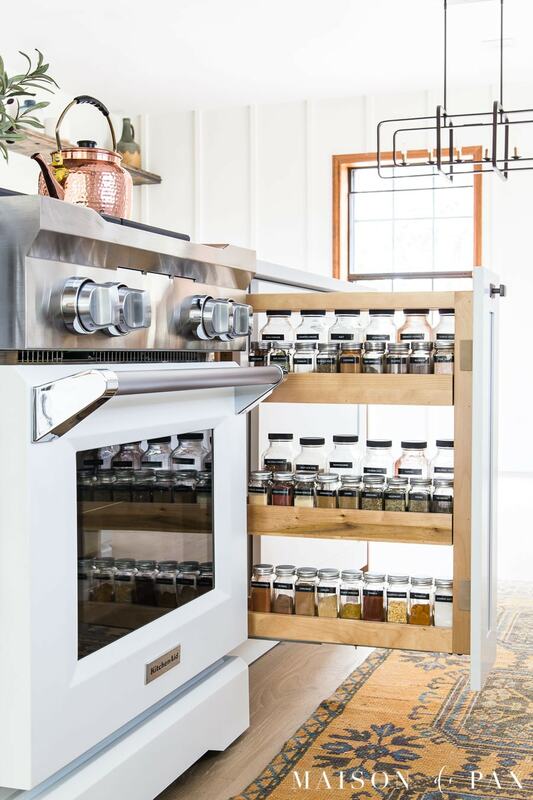 That spice rack is my one year old’s dream– and mine too. Wow! Totally blown away by how your vision came together. Such a wonderful space for you and your whole family. It turned out gorgeous . So happy for you. Thank you, Dorenda! I hope it’s a place of many family memories! I LOVE your new kitchen! 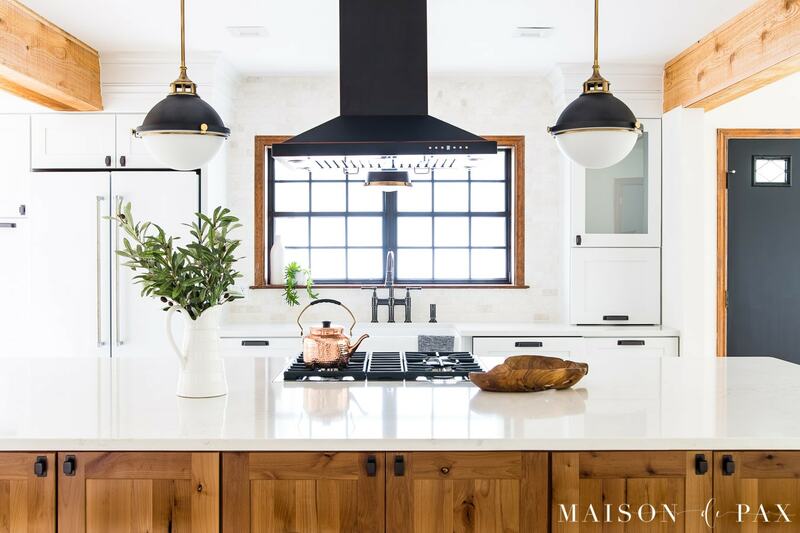 The white appliances are my favorite part – we went with white in our new kitchen renovation and I couldn’t be happier!!! Just beautiful! I love the white appliances too! Maybe we will start a new trend? Oh my goodness! This is simply beautiful and your eye for design is amazing! 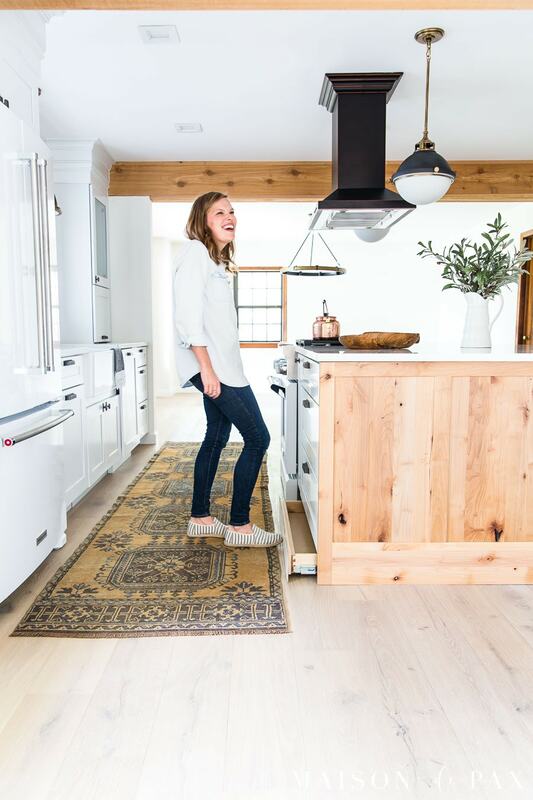 If I hadn’t just redone my kitchen a few years ago, I’d be copying your design! Make special memories in this beautiful place! Thank you! I can’t wait to start using it as a family. 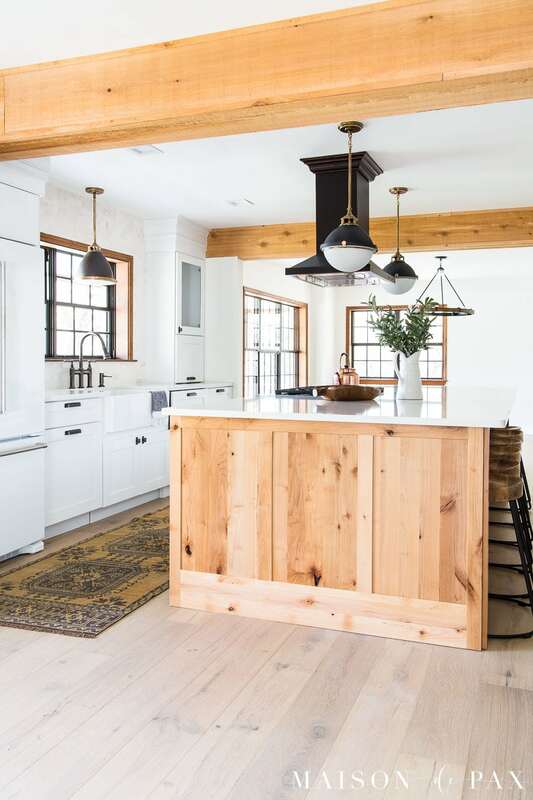 Beautiful kitchen and it is refreshing to see the wood island and beams incorporated into a white kitchen. 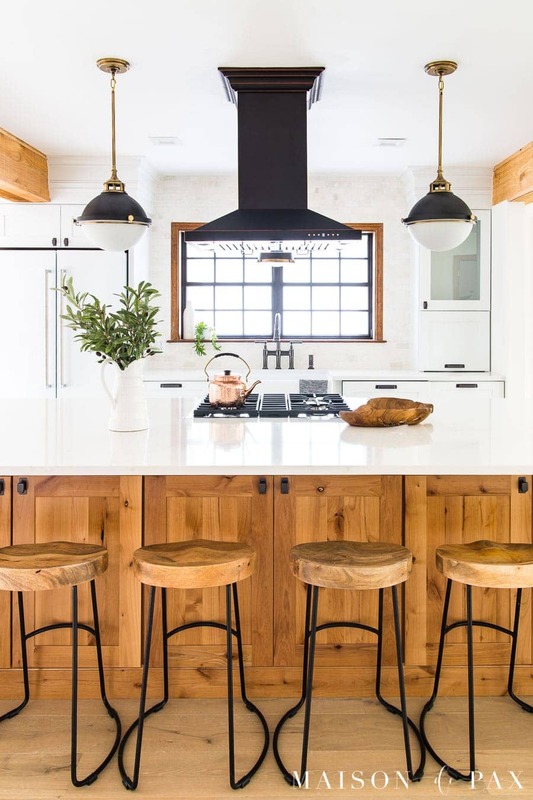 Love the mixture of natural elements with the crisp white appliances and cabinets and the black accents. Beautifully done! Enjoy! Thank you! I love that you noticed all those details. Whoa! Spectacular! I love the pops of black, too! Most are from Ebay and Etsy! Gorgeous!!! Blessings upon you and your new space, may you enjoy many wonderful family times here! Thank you, Becky! We are so excited to make new memories here. Thank you, Shannon! I’m so excited! Beautiful job! 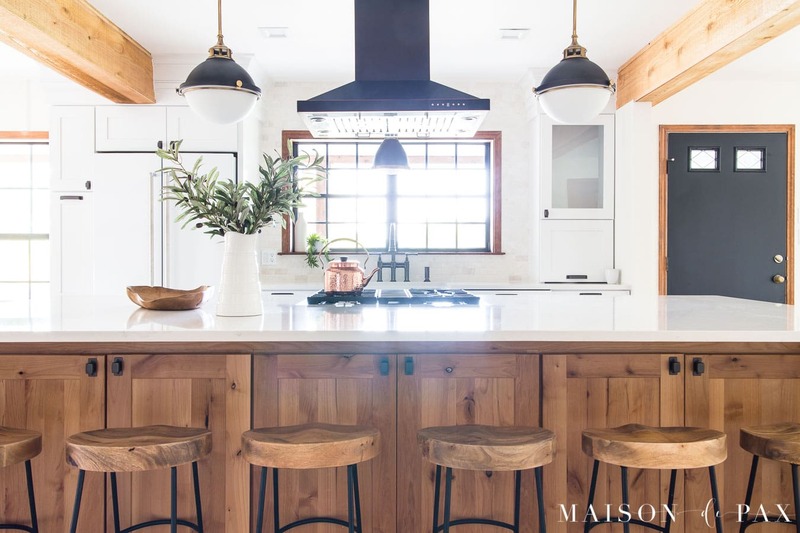 Cabinetry couldn’t be more perfect! 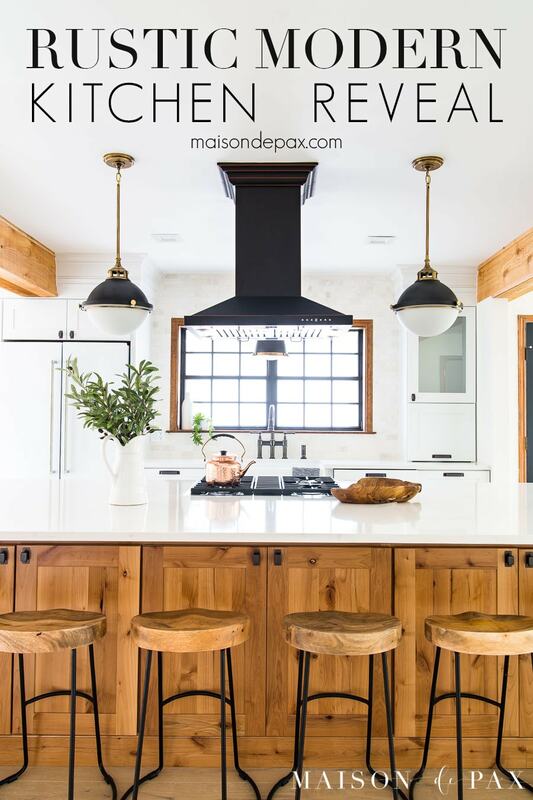 The pendants over island and sink are really eye catching. Who is the maker and were they purchased online or in store? Thanks! Beautiful. Just love all you have done. Can you please tell me where you purchased the spice jars large and small. 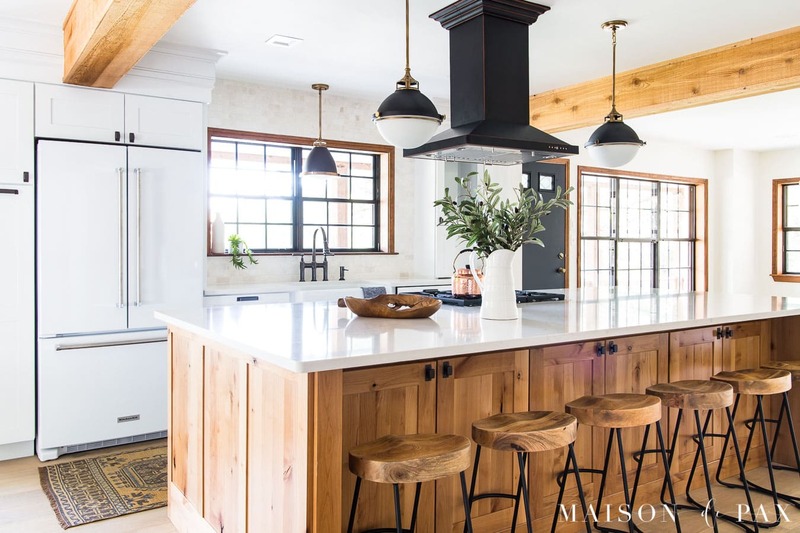 What a gorgeous kitchen you’ve put together! I am super impressed with the quality of KraftMaid and the storage options. 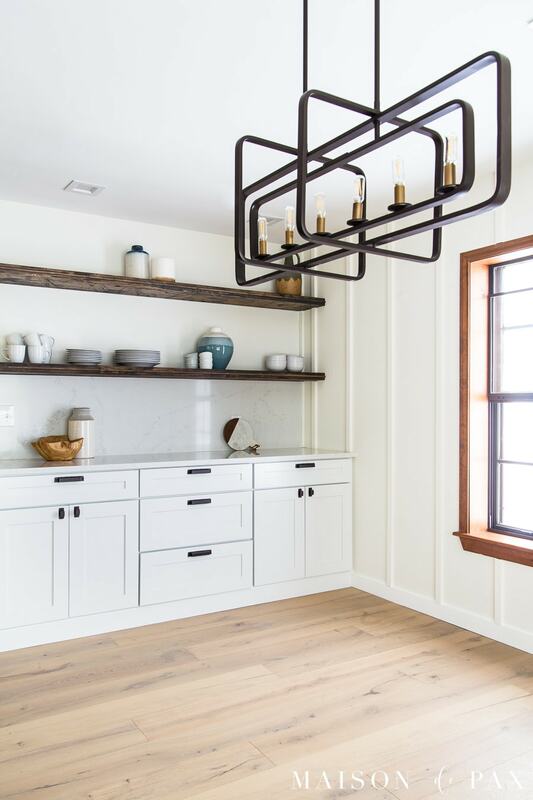 The rustic alder is just perfect in this space! Thank you! I love the new cabinets! Outstanding!! Congratulations & thanks for sharing your journey. Beautiful work. Love it all. Just beautiful and so functional. And where did you get the beautiful runner? I love those toe kick drawers! I’ve never seen anything like that before. I can see all the love and dreams that went into your kitchen. A lot of great memories are just around the corner. Thank you, Cyndi! I’m so excited to share it! Would you be able to share with me the product and color used on your ranch countertop and your home countertop. Thank you. Absolutely stellar, Rachel. A truly beautiful transformation! Your kitchen is lovely. Where did you get the barstools? Great job! I remodeled my kitchen a couple of years ago and already I wish I could do it again – 20/20 hindsight. You’ve done a great job of planning the organization you need. Yay you! Thank you! I’m sure your kitchen is amazing! I believe this is the best one yet, the other kitchens you had were pretty wonderful but this one is super. You have really accomplished a dream. Thank you! I love how it feels so much my style, but different from my white and marble kitchen. 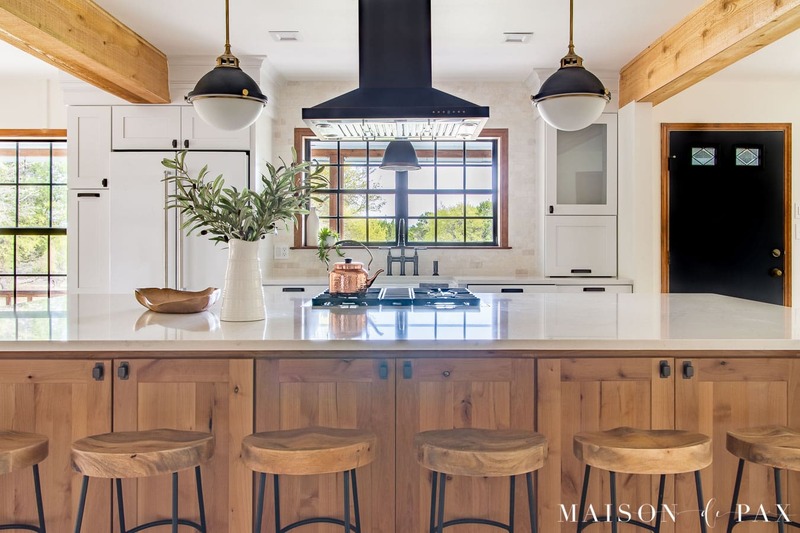 This kitchen is to die for!!! You’ve done an awesome job!!! I LOVE your dining room light fixture! Maybe you’ve referenced it before & I’ve Missed it, but could you please share where it’s from? TY! Love it. It’s so much fun to start fresh. God bless. I agree! It’s been so fun to start at the beginning! Thanks! Wowser! How incredibly beautiful….Every. Single. Detail. What an incredible sense of pride and accomplishment. It’s absolutely gorgeous. Congrats. Thank you! I’m so excited to share it with you all! Wow! Just wow! This is not only absolutely beautiful but it’s so smart. 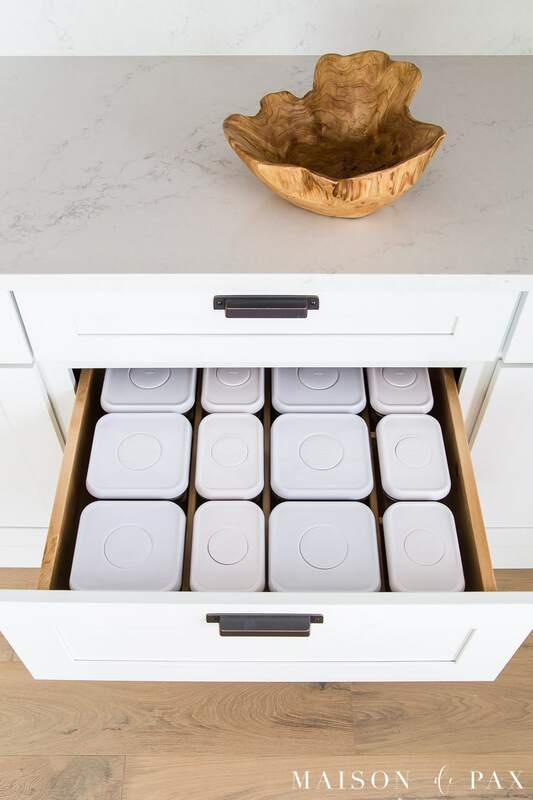 Love all those clever storage ideas. Everything works so well together too. I think you may bring back white appliances! May you and your fam make wonderful memories in it! Maggie! You are so sweet! White appliances are really amazing! I’m loving all of these fun cabinet options! Beautiful job! Can you tell me what the flooring is made of? Would like to use that in my dark kitchen! Gorgeous! Considering Kraftmaid for our kitchen reno. May I please ask the dimensions of your island, both cabs and countertop? Thank you! The cabinets are 10 feet wide and 3.5 feet deep (24″ deep cabinets on the range side and just 18″ deep cabinets on the bar side). 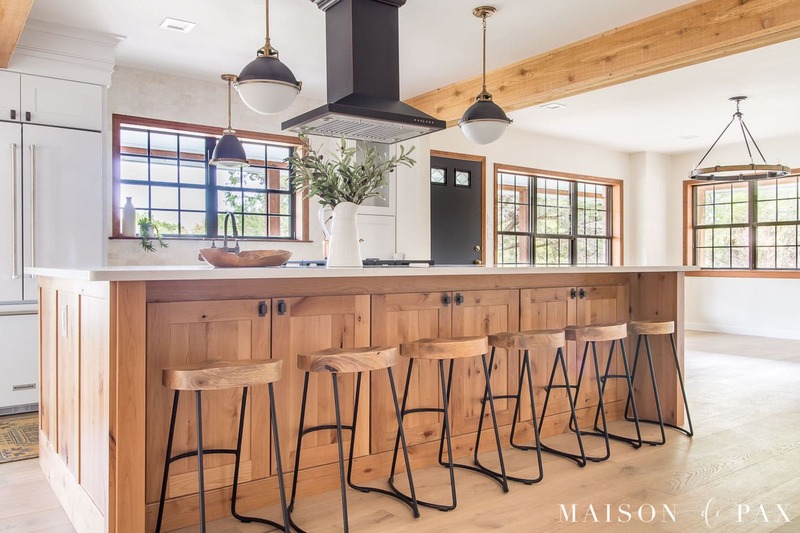 The countertop is approximately 10.5′ wide and 4.5′ deep (just a little overhang on three sides and a full foot on the bar side). Hope this helps! I cannot thank you enough for the info!!! So helpful! Thank you, Elizabeth! I am so excited to share it with you all. Double WOWZA!!! Your kitchen, your house and you…. ALL BEAUTIFUL! Gorgeous! Oh how I miss my KraftMaid cabinets! The new owners of my old home were so excited to get those cabinets so it’s a good selling point too for those who are considering new cabinets. That’s so helpful to know, Patty! I’m excited and love these new cabinets! Rachel, the kitchen is gorgeous! Of course it is as you designed it and it so says, “Rachel”. I am thrilled to see the white KitchenAid appliances as I have only seen them on-line. These are the appliances I have chosen for the new house. So happy to see them here! The kitchen truly has a very happy personality!!! 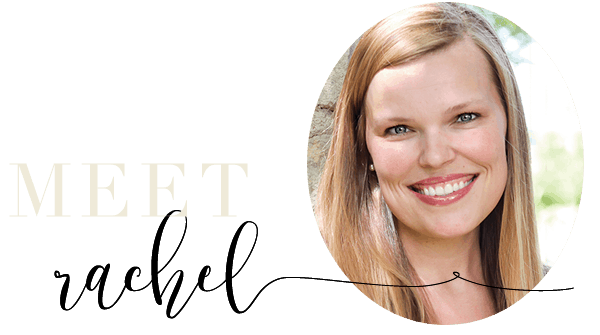 Bravo Rachel!!! Thank you, Shirley! 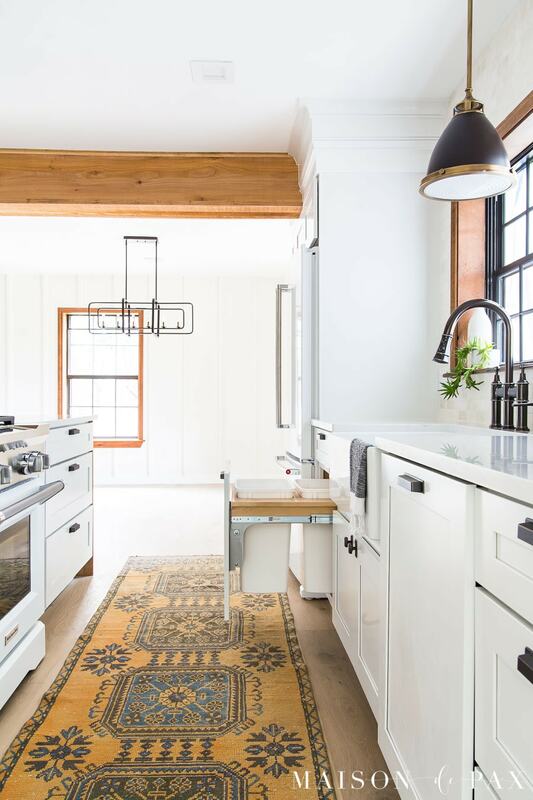 It was so fun to design a kitchen that felt like ‘me’ but also true to the Texas Hill Country space!